Del Taco has made several menu upgrades recently. The biggest change (and biggest value) is their new "Macho Value Menu." The value menu offers 7 items for under $1. 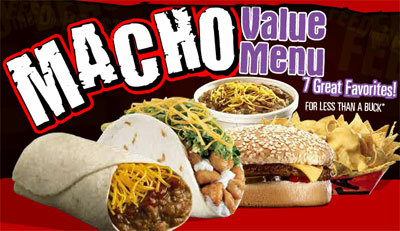 Items under $1 include the Chicken Soft Taco (99¢), Breakfast Burrito (69¢), 1/2 lb. Bean and Cheese Burrito (99¢), Bean Cup with Cheese and Red Sauce (89¢), Cheeseburger (99¢), Nachos (99¢), Del Taco Cheeseburger and Taco (99¢). The Chicken Soft Taco (on the value menu for 99¢, has 50% more meat now. It is marinated grilled chicken with Del Taco’s secret sauce, lettuce, cheddar cheese and a soft flour tortilla. Del Taco is also introducing a new Mexican Caesar salad as an entrée for $3.19 or side dish at $1.59. The new salad features crisp lettuce, cotijo cheese, diced tomatoes, roasted pepitas, cilantro pepita dressing and topped with seasoned tortilla strips.